London Carpenter provides skilled and reliable carpenters in London delivering made to measure carpentry solutions. 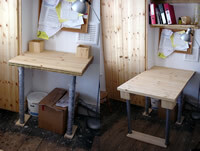 The londoncarpenter.co.uk website is owned and operated by Adam Whittle. 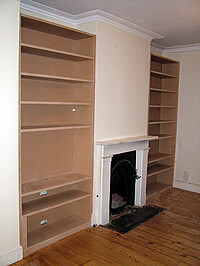 Free estimates for bespoke carpentry work in London. Please complete our online form below for an estimate or to discuss your carpentry project. 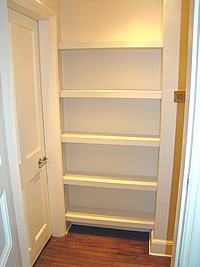 If possible please supply approximate sizes and number of shelves/ cabinets to allow us to provide you with a guide price. Following these guide prices we are very happy to arrange site visits to discuss designs in detail. To speak to us personally please call Adam Whittle on 07808 475 445. Click the images in each side column to get a closer look at the designs; a short description of each can be read below each picture. 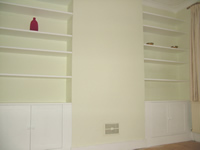 "Thanks so much for your work today; I'm really happy with the shelves, they look great!" Helen, London N19 January 2019. 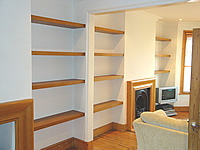 "We were very pleased with the result of London Carpenter's work installing shelves in 3 rooms of our flat. The workmanship was first class, and quickly executed precisely what we had in mind. 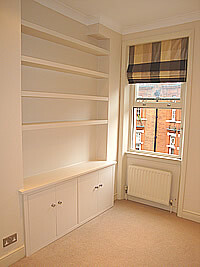 We would recommend London Carpenter without hesitation to anyone needing high-quality professional carpentry done." Stipo, London WC1N November 2018. 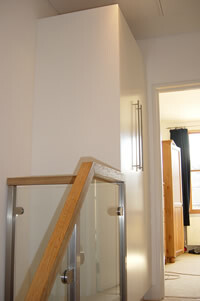 "We were delighted with the service from London Carpenter. He was very responsive and we are very pleased with the quality of the finish." Nathan, London W9 September 2018. "Thanks so much again - really happy with how it turned out. And the how process was an absolute pleasure!" Max, London SE9 June 2018. "Thanks so much for the shelves and cabinets. They look so great and have stored all of our paperwork." Ellie, London SE5 May 2018..
"Thanks again for the shelves, they're great. I've never been so excited about organising the flat!" Pete, London EC1V April 2018. 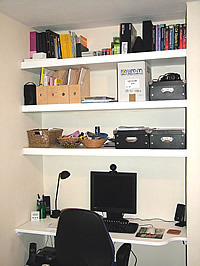 "Thanks so much for the wonderful shelves, they have transformed our lives!" Helen, London N3 Februrary 2018. "The shelves look great, thanks very much." Ollie, London SM2 December 2017. "We are very happy with your work and actually my husband said that it's the best handiwork he's seen in London :). I keep going in to stare at the shelves because they make me happy." Ellen, London SE14 November 2017. "The cabinets look brilliant, thank you!" Doug, London October 2017. "Thanks again! 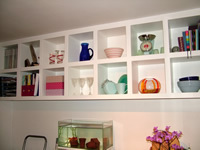 I have sent a photo of the shelves with some of our things on top we're enjoying them very much! Zerina, London SW13, September 2017. "I absolutely love my new shelves! 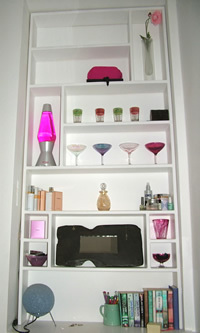 They are exactly what I wanted and to have proper well made shelves has made my room look really fantastic! Thank you so much, you did a great job!" Jane, London, August 2017. 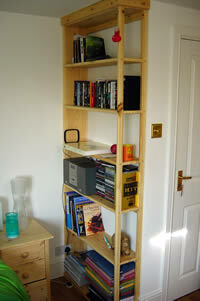 "Thanks again for making and fitting the shelves and cabinet - they're exactly what I wanted. It was a pleasure to meet you and I hope our paths will cross again." Alom, London, BR1, June 2017. "Thanks for the great work!" Pete, Godalming GU8 May 2017. 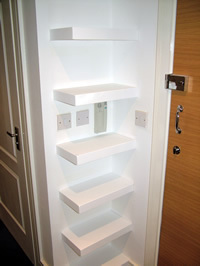 "London Carpenter I just wanted to say how pleased I am with the shelves - they are perfect! And thanks for being such a pleasure to have in the house." Sara, London SE26 February 2017. "London Carpenter was professional in all communication from enquiry onwards and very patient explaining different options of shelving. The work was great and was tidied up perfectly. We're very happy with the work & the quality of the whole service. I would highly recommend' Louise, London SE25, January 2017. "Just wanted to say thanks so much for the amazing job." Chris, London W4, December 2016. 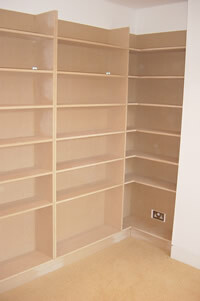 "London Carpenter did a great job in fitting shelves in a lounge and bedroom. They fit perfectly within the rooms and I would definitely recommend him." Patrick, London SW4, October 2016. 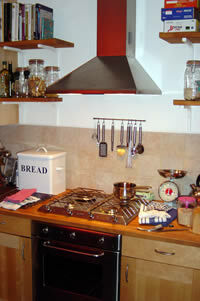 "Thanks again for such a great job on our cupboards and shelves, we are so happy with them, exactly what we were after." Laura, BR7 July 2016. 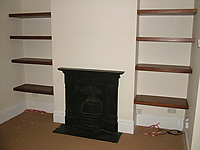 "Once again thank you for the shelves - they are now fully loaded with the vinyl record collection and look great." David, WC1N June 2016. "The shelves look great, thanks very much." Robbie, London SW1P May 2016. 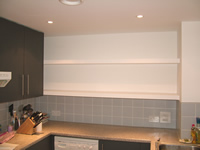 "Thank you London Carpenter for the floating shelves, I am so happy with them. Several people have commented on them and asked for your details already. So glad we could get them done in a v. short time and thanks for the expert problem solving." Kirsty, London EC4A April 2016. "Hi London Carpenter, thanks again for installing the shelves today, they look really good, particularly with the lights in the evening!" Mr Machin-Kocon London SE26 December 2015. 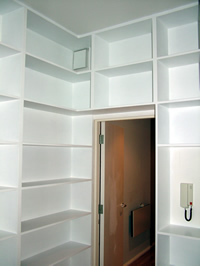 "Thank you for the smooth installation of the alcove shelves yesterday. 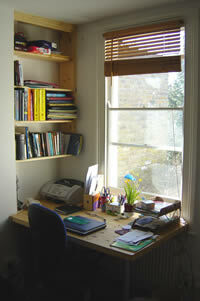 London Carpenter you have done a great job and they look fantastic in our study." Mr Hui London NW11 October 2015. 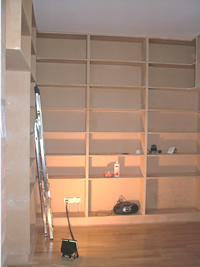 "London Carpenter thanks for doing a great job on the bookcases." Rebecca, London SW17 July 2015. 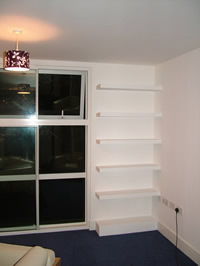 "Thank you London Carpenter for our perfect shelves, our flat is honestly transformed and I am very grateful." Hannah, London NW6 January 2015. "Thank you London Carpenter Everything’s great – the IT guys are very happy. Once again, a fantastic job done!" Jane, London SE1 November 2014. 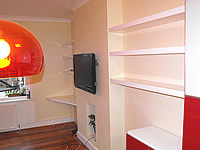 "Thanks for a brilliant job on our desk, floating shelves and cupboard. Every little detail beautifully executed to the highest standard with no mess or fuss. You have our recommendation." Mr Nortje, London SW19 - August 2014. 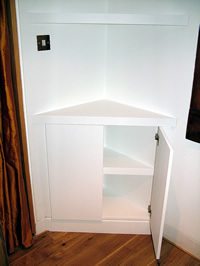 We are absolutely thrilled with our alcove shelving and cabinet. London Carpenter was professional, trustworthy, punctual and extremely conscientious throughout with very good attention to detail, working with us to tailor the design perfectly. London Carpenter even sourced special cabinet handles to match the lounge decoration. I wouldn't hesitate to recommend the service. Ms Al-Seffar W9 - August 2010. "Once again let me say we are very happy with the alcoves, they have completely changed the ambiance in the room and we are very grateful for your hard work and attention to detail." Mr Bichard SE21 - June 2010. 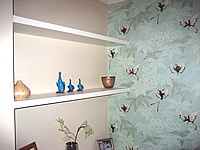 "Very good to see you the other day, and thanks for doing such a great job with my floating shelves. I'm very pleased with them. Please can you quote me for a second set." Mr McNeil NW6 - April 2010. "Excellent workmanship and delivery. I can't recommend London Carpenter too highly." Mr Miller SW1P - February 2010. 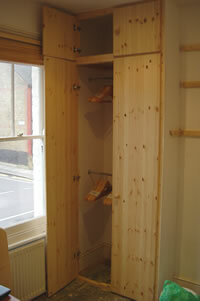 Skilled and reliable carpenters in London offering made to measure carpentry solutions.